I am an outdoor photographer who values wide open spaces and quiet. Using multiple exposure and in-camera movement alongside conventional methods I create very personal, often abstracted representations of place, mood and emotion. I am studying for an MA in Visual Art (book art) at University of the Arts, London, as a means to find new and varied ways to present my photographic work. 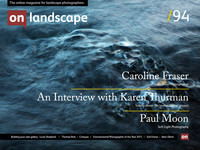 Caroline Fraser’s images from New Zealand have made some think she hails from down under, so an interview with her is a good chance to clear this up (she lives in Sussex). However busy Caroline’s work-life balance may be, she always finds time for photography – or setting down her thoughts (mostly about photography) in her blog. Being out with her camera is both a creative outlet and essential part of her well-being.